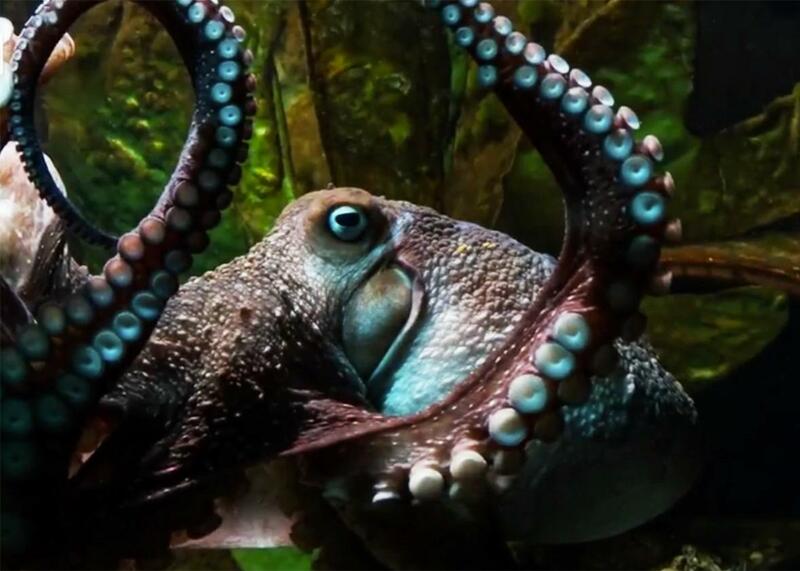 Inky’s aquarium escape reveals the mystery of octopus intelligence. Don’t Anthropomorphize Inky the Octopus! Not because it’s bad, but because it might make you miss what’s so fascinating about these creatures in the first place. Making his way across the floor of the New Zealand National Aquarium, Inky the Octopus compressed his body into a drainage pipe and made his way out to the ocean. Others embraced and amplified this human account of Inky’s actions after his escape (though it occurred months ago, it penetrated the international news on Tuesday). The Washington Post describes the story as a cephalopod version of the Shawshank Redemption and cites a tweet from the Canadian organization Animal Justice celebrating Inky “for breaking out of aquarium jail.” Other filmic references and cultural allusions proliferate in further coverage, with the Guardian proposing that it is “reminiscent of Finding Nemo” and the New York Times comparing Inky to Houdini. A roundup of journalistic reactions from the site Muckrack points to an even more aggressive pattern of anthropomorphism. Particularly on social media, journalists seemed to find a personal hero in the octopus. “Je suis Inky,” one cephalopod rights activist jokes, while another announces, “Today, we are all this octopus, who looked around at his life situation and said, ‘F**k this.’ ” These responses are all in good fun, of course, but they speak to a familiar pattern, one that finds humans turning the most unusual creatures into simple metaphors for our own plights. Unable to domesticate the animals themselves, we tame their strangeness instead. Anthropomorphism has long divided biologists and naturalists. In theory, at least, avoiding it helps us see animals as they are instead of turning them into distorted mirrors of our own experiences and expectations. And yet, as the primatologist Frans de Waal proposes in a recent New York Times article, an absolute prohibition against anthropomorphism may paradoxically affirm human exceptionalism. Instead, when we recognize how human nonhuman species can be, de Waal suggests, we may be able to treat them a little more generously—and may come to understand ourselves a little more fully in the process. The journalist Katherine Harmon Courage points to a similar conclusion in her book Octopus!, quoting the filmmaker Jean Painlevé, who claims “we couldn’t appreciate anything around us” without anthropomorphism. But when we speak of celebrity octopuses as if they were just like us, we may actually minimize how wonderfully strange they are. What’s astonishing about Inky’s story isn’t that he escaped—in fact, octopus literature is full of such flights to freedom—but how he figured out that such a path to freedom might be feasible in the first place. By minimizing those details, we’re effectively recontaining Inky and his ilk, trapping them in aquariums of a different sort, enclosures with walls made of misconceptions rather than glass. And the octopus should be put in anything but. Alien as these creatures look on the outside, they are even more so within: The primary mass of their unusually large brains isn’t located in the head, but is instead wrapped around the esophagus. Neural tissue also spreads throughout their eight arms, with “a ganglion controlling every sucker,” as octopus researcher Jennifer Mather explains, which allows them to perform thousands of independent gripping motions. All that extra-cranial complexity doesn’t exactly make octopuses “smart” by conventional human standards, but it helps reveal why they’re such compelling subjects. Solitary hunters, theirs is an embodied intelligence altogether different from humans’ socially focused forms of cognition. In her deeply moving book Soul of an Octopus, Sy Montgomery writes of her first encounter with a giant Pacific octopus named Athena. As Montgomery dips her hands into the water, Athena reaches out to meet them. “She is at once touching and tasting my skin, and possibly the muscle, bone, and blood beneath,” Montgomery writes. Octopus researchers often speak of their subjects as curious creatures, and it’s easy to see why: They explore and interrogate their world with their arms, which in the case of the octopus, means with their brains—a profoundly alien sensory apparatus, as Montgomery’s description suggests. Montgomery quickly comes to feel that Athena understands her, a conviction informed by her belief that this creature has attitudes and orientations all its own. Many cephalopod biologists seem to agree with some version of this stance, holding that octopuses have personalities. Courage, for example, writes that aquarium keepers tend to name individual octopuses in part because they “exhibit individual behavior patterns distinct enough that we humans could pick up on them,” an anomalous trait among invertebrate marine animals. Those identifiable eccentricities may allow us to distinguish them, but they actually make these cephalopods harder to understand as a species, contributing to their alienness instead of dispelling it. Even researchers who work with them regularly do not understand what whimsical tides convince these temperamental creatures to occasionally participate in research experiments—and occasionally decline, for reasons all their own. Further complicating this difficulty, octopuses are largely solitary creatures, and their intelligence evolved in relation to their isolated form of existence. As Mather explains in a book that she co-authored with Roland C. Anderson and James B. Wood, this makes it hard to apply conventional tests of consciousness to them. On the tendency of octopuses to eat others of their kind, they write, “The fact that octopuses will be cannibals if they can, suggests that octopuses don’t have an octopus-recognition-template in the brain.” In its own turn, this implies that they’re not capable of recognizing themselves in a mirror, a capacity we often use as an index of supposedly higher forms of intelligence. But even if octopuses presumably aren’t conscious in the way that humans are, that doesn’t mean these tool-using, playful creatures aren’t intelligent. They are simply intelligent in a qualitatively different way than we are. Mather and her collaborators describe an experiment testing octopuses’ ability to open a glass jar with a herring inside. Though the invertebrates were able to unscrew the lid, doing so took time. When a researcher smeared herring on the outside of the jar, however, the creatures learned to open it much more quickly. Part of the issue, the authors suggest, may have been that when the jar was caught up in the tangle of octopus arms the creatures literally lost sight of their goal, while the nonvisual sensory cue kept them focused on the task. Try to understand an octopus solely in human terms, in other words, and you’ll never get at what makes them fascinating. Even de Waal dwells on this truth, despite his cautious call for anthropomorphism. “It makes no sense to compare our cognition with one that is distributed over eight independently moving arms, each with its own neural supply,” he writes. Montgomery, for her own part, quotes a famous maxim from Ludwig Wittgenstein’s Philosophical Investigations: “If a lion could talk, we could not understand him.” Language, Wittgenstein held, is fundamentally embedded in the ways we move through and make sense of the world. If we could not comprehend a lion, how could we hope to approach something as strange as an octopus? In context, however, that Wittgensteinian aphorism is surrounded by thornier reflections on the difficulty of understanding our fellow humans. That difficulty—the ostensibly essential unknowability of the other’s interiority—doesn’t preclude us from trying to understand them or acting as if we do. He writes, “If I see someone writhing in pain with evident cause I do not think: all the same, his feelings are hidden from me.” Montgomery, likewise, lets the uniqueness of the creatures she studies draw her in, an experience not unlike reading a difficult poem whose beauty attracts even as its full import always eludes us. “As I stroke her with my fingertips, her skin goes white beneath my touch,” she writes of meeting Athena. And white, she learns, “is the color of a relaxed octopus,” the hue cuttlefish take on when they know that they’re safe. If she attributes emotion to Athena here, she attempts to do so on Athena’s terms, not her own. That may be why Montgomery saturates her descriptions of cephalopods with a vocabulary of suggestive uncertainty. “As if,” “seems,” and “like” are her watchwords. Because it is so hard to know the octopus, we want to. And because we want to, we are all but obliged to describe them by way of simile. These poetic gestures at once acknowledge their distance from us and attempt to cross that briny divide. This is how we honor our most radical others: not by holding them in place with our language as a biologist pins a specimen to a board, but by caressing them with our words, as an octopus does when it meets a stranger. There’s a lesson here for those celebrating Inky’s unlikely escape, a reminder to celebrate his strangeness as well. An octopus’ life in an aquarium might be boring, but it’s not dull in the same way that a slow day at the office is. Perhaps instead of equating Inky’s adventure with our own banal travails, we should stretch our imaginations to better understand his plight.